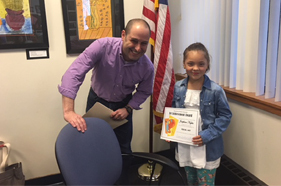 Simsbury Public Schools and the Simsbury Department of Continuing Education announce four “Summer Academies” to spark student learning throughout the summer! The district-wide assessment calendar for 2018-19 will be posted in the spring. If you have any questions about the schedule, please contact your child's school. 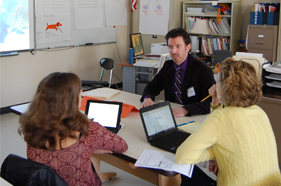 Simsbury Public Schools utilizes many online applications and web-based tools to foster student learning through personalization, collaboration, and exploration. Online or "cloud" based applications and services extend student learning beyond the school day and building and provide accessibility to useful learning tools. 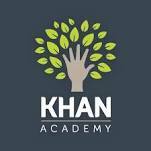 We use educational accounts for most of our online services in order to have more control of settings and ease of classroom setup. Prior to recommending a service for classroom use, we review the service's privacy and security policies and inform teachers of best practices for using them responsibly. We do not approve providers who use personally identifiable information outside of Family Educational Rights and Privacy Act (FERPA) standards. Since October 1, 2016, renewed or new online services that house student information, records and/or student work on their servers must also meet the minimum requirements of the Connecticut Student Data Privacy Law; Public Act 16-189. See the Student Data Privacy resource tab for more information on the law and a complete listing of third party services utilized by the district for operational and educational purposes. These services include G Suite for Education, which is used extensively by our students and teachers in grades 3 through 12 for classroom and homework assignments. In keeping with the Children’s Online Privacy Protection Act (COPPA) and our licensing agreement with Google, if you as the parent/guardian of a student under the age of 13 is concerned about this usage and would want to discuss opting out please contact jlytwynec@simsbury.k12.ct.us for more information. Compiled below, by grade-level, are the most widely used online educational services presently recommended for classroom use that require students to log-in with a student account. For some of our online educational services we provide students with generic school log-ins that are not unique to a user and/or their directory information. For complete information on each app's terms of service, please click on the provided links below. Each K-1 classroom is equipped with 7 student iPads. Most of the apps with these iPads are downloaded apps that do not require Internet access or student log-ins. There are a few apps and online services that can be personalized for student learning, and these require a unique log-in. Starting in third grade, students participate in the online Smarter Balance Assessments. To help prepare students for this testing environment, they are given limited Google Apps accounts (there are no active email accounts for grades 3-8) to use at their teacher's discretion. Teachers may also choose to have students participate in group projects, e.g., online reading discussions, through the district Wikispaces Campus service. This is a teacher-moderated space used as an online extension of the classroom. In grades 5 and 6, students continue to have the online services described in grades 3-4 available to them with the addition of Explore Learning concept simulations-GIZMOS. Teachers at this time may also explore the use of moderated blogging applications, which requires approval by the district and possibly parent sign-off. 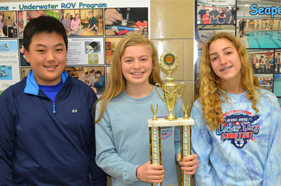 At the middle school, some of the online services provided are aimed at giving students more help with managing their workload and obtaining online feedback from their teachers and peers. Teachers may have students use district-approved Chrome extensions/apps for class projects when using the Chromebooks. Students are expected to follow the HJ Way and the Responsible Use Policy when online as stated in the Student Handbook. At the high school, students rely heavily on online services, especially when working on Chromebooks. Teachers may have students also access Chrome extensions for video and audio production during some projects, using their Google Apps log-in. These extensions must meet FERPA requirements if assigned for use by the teacher. Whenever using any online services, students are expected to adhere to the principles of the Trojan Code and the Responsible Use Policy as stated in the Student Handbook. In 2011, we became a G Suite for Education (previously known as Google Apps for Education) district in order to take advantage of the online productivity suite similar to Microsoft Office. Teachers and students have since found the collaborative nature and mobility of a cloud drive to be extremely helpful with work flow. G Suite for Education is one example of an educational online service account that allows the district to have more control over settings based on grade level and security concerns. Students in grades 3-12 have individual log-ins to G Suite in order to access Chromebooks and the G Suite apps. Only grades 9-12 have active school gmail accounts. 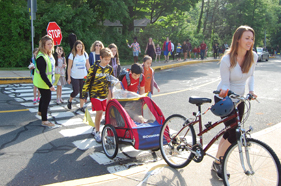 For grades 9-10 these accounts are limited to our school domains: simsbury.k12.ct.us and simsburyschools.net. 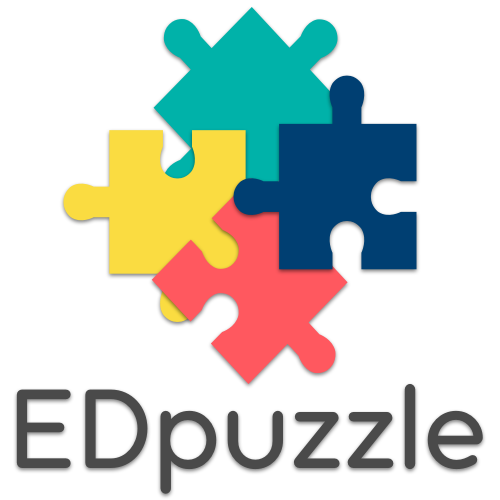 For grades 11-12 students can also access .edu domains for college applications. Students cannot receive or send emails outside these domains except for receiving emails from other school-provided services for password resets, etc. These accounts are for school related work and activities only and are not to be used as "personal, private" accounts. In keeping with the Children’s Online Privacy Protection Act (COPPA) and our licensing agreement with GAFE, if you as the parent/guardian of a student under the age of 13 is concerned about this usage and would want to discuss opting out please contact jlytwynec@simsbury.k12.ct.us for more information. Answers to many top questions about privacy and security appear on Google for Education Trust page. G Suite for Education Privacy Statement describes how Google products and services collect and use information when used with G Suite for Education accounts. Information about the legal commitments Google makes for G Suite for Education Core and Additional Services is available in their Help Center. Information about how Google’s products work to protect privacy is available in the Product Privacy Guide. In 2016, Google added the option for parent/guardians to receive weekly or daily email summaries of assignments/ announcements/ questions posted through teacher Classrooms. The Youtube video below is an overview of this feature. Click on the image below for written directions on how to receive notifications and how to manage settings. You can also click on the link for FAQ's to help you with how to opt back in if you opt out at some point. You will need a Google Account to change settings for email summaries. You can create this account with your current email address; you do not need a gmail account. See the link below to set up a Google Account. 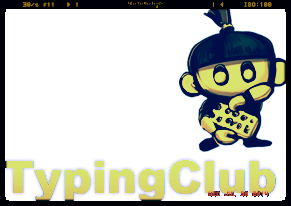 We are happy to announce the switch to Typing Club, a completely online keyboarding program. Students in grades one through six have had accounts created for their use, and teachers have given them their log-in credentials. These will also be shared at Open House. Computer literacy has become a core element of K-12 education, with students now expected to master keyboarding skills before college. In fact, several of the Common Core Standards require keyboarding. TypingClub School Edition is designed to help your students meet and exceed the Common Core Standards within a semester’s worth of time. Our test templates are deeply customizable so you can alter settings to best prepare your students. Once your students learn proper keyboarding technique, they can practice to increase typing speed, improve accuracy, and develop stamina for typing. “Type ONE page in a single sitting." “Type TWO pages in a single sitting." Fluently communicating with others via the internet, especially when instant messaging, requires keyboarding proficiency. Academic integrity is one of the most important values we can instill in young students. Keyboarding lessens the physical burden of typing, thus making students less likely to copy-and-paste entire paragraphs. The only way to increase stamina is to practice typing passages of varying lengths. Our Typing Tests provide an excellent resource for this kind of practice. The score system is optimized to value accuracy over speed. It accounts for student corrections by calculating the true-accuracy of each attempt, which reduces a student's score each time he or she uses backspace to correct an error. Then, the student's word per minute (WPM) speed is factored into the score. When a student finishes each lesson, these statistics are sent to our calculation engine which produces an overall score. Once you have a handle on the accuracy, the only way to increase your score is to work on your speed. Stars are awarded based on a student's performance in each lesson. They are used to control whether the student can move on to the next lesson, or must retry for a better score. Each lesson has a pre-established minimum star amount required to pass, but the teacher can modify that requirement to customize the difficulty of each lesson. The mission of the Global Experience Magnet School in Bloomfield is to create a learning community dedicated to educating one student at a time. This is accomplished by designing a personalized learning plan for each student, providing real-world opportunities to connect students to their learning, and expecting them to find authentic, meaningful ways to show what they have learned. If you're interested in giving your child an extraordinary education, consider one of CREC's award-winning magnet schools. CREC magnet schools allow students to focus on specific talents or interests while studying a challenging core curriculum in a diverse environment. 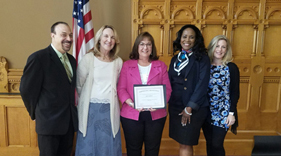 The Connecticut Student Data Privacy (SDP) Law was enacted to provide transparency to the school community on the sharing of student data with third party service providers and to put in place minimum contractual requirements to safeguard student privacy (See Revision of Bill for update). This law does not apply to services that the district houses on our internal servers such as Powerschool and Destiny, or on district devices (computers/iPads) which includes many of our educational software and iPad apps. District prerequisite(s) for using these services safely with students are published for teachers to reference on our faculty portal. notice of a breach within 2 days of notification from provider of service and what student information may have been involved. This notification will also be posted on the district website. Please see the links below for the listing of approved third party services presently contracted with by Simsbury Public Schools that may collect/maintain/ use student information in the delivery of operational and educational services. The SDP agreement used by the district is based on the Terms of Service template provided by the state. Informational forums will be held over the school year through PTO/ PTC meetings on this new law. Make sure they are looking at the screen and not their fingers (you can tape a sheet of paper to the top of the keyboard and have your child place their hands underneath). All eight fingers should rest lightly on the “home row” (grey keys below) with both thumbs above the space bar at all times. The “F” and “J” keys have raised lines on them to help position hands. Set aside 15 to 30 minutes for a minimum of 3 times a week to encourage muscle memory. Try to limit distractions during this time. National PTA.org National Parent-Teacher Organization website offers a story by one of the nation’s leading advocates for children. The Positive Coach This site is the center of a national movement to encourage positive and supportive parent participation in youth sports. www.jbocallaghan.com Dr. Brien O’Callaghan provides an overview of Home/School Collaboration approach. Offers insights into children’s behavior and common sense approach for parents. Positive Discipline Dr. Jane Nelson offers a wealth of resources for parents and teachers. Questions of the week provide strategies for dealing with common problems experienced by parents.